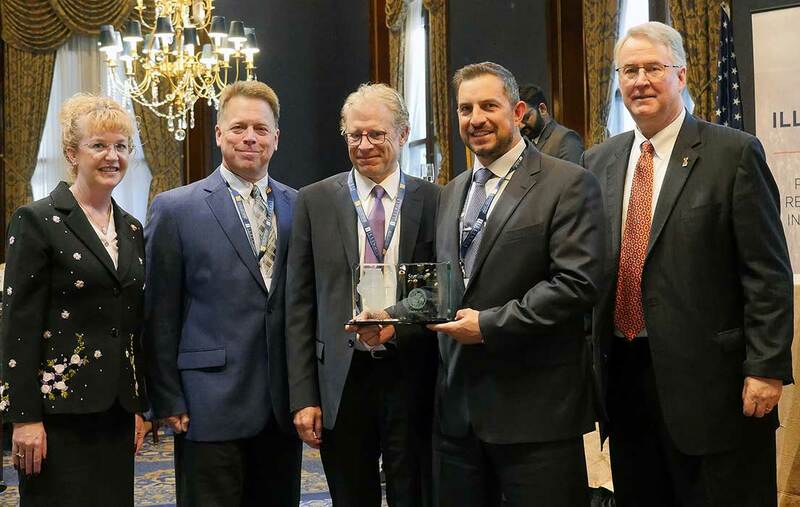 Phoenix, Ill. – Sterling was presented a 2018 Illinois Sustainability Award for their commitment to environmentally sustainable products and practices related to its TerraLam® Cross-Laminated Timber (CLT) mats during the 32nd annual Illinois Sustainability Awards Tuesday in Chicago. Sterling’s TerraLam CLT mat uses sustainable southern yellow pine (SYP) to create a site access mat that is lighter, faster, and longer lasting. Because of the its reduced weight, more mats can be carried per truckload which results in a decrease of up to 60% in carbon emissions from freight. The mats are used primarily in the electric transmission and distribution, oil and gas pipeline, and civil construction fields. Site access mats are used to protect sensitive or undisturbed soil in rights-of-way from tires and tracks of heavy construction equipment. Sterling also has focused on sustainability in their manufacturing facility in Phoenix, Ill. Motion detected zone LED lighting and a strong office recycling program have reduced energy consumption and waste. A recycling program for culled mats and mat remnants mean that no lumber is wasted. The mats are reused in a variety of ways, including being ground for mulch, used for livestock bedding, or even becoming a component of bio-fuel. The goal of TerraLam is eliminate the false perception among contractors and utility owners that they must choose between sustainability and profit – because with TerraLam you get both. One of the most significant benefits of TerraLam is its strength to weight ratio. As a result, the same number of TerraLam mats can be shipped with nearly 50% fewer trucks when compared to traditional bolted mats. This also translates to time saved unloading, moving down the right of way, and installing the mats. Reduced labor and equipment time mean projects are more likely to stay on time and be safer. This reduction of freight and equipment time also creates a significant reduction in carbon emissions. Saving the hardwood forests is yet another benefit as TerraLam CLT mats are built with farm-raised southern yellow pine (SYP). SYP grows to maturity in as little as 20 years, a dramatic difference to the 80 years required for hardwoods such as Oak and Maple, which are traditionally used for bolted mats. A division of the Prairie Research Institute at the University of Illinois, Urbana-Champaign. ISTC’s mission is to encourage and assist citizens, businesses, and government agencies to prevent pollution, conserve natural resources, and reduce waste to protect human health and the environment of Illinois and beyond. ISTC integrates applied research, technical assistance, and information services to advance efforts in the areas of pollution prevention; water and energy conservation; and materials recycling and beneficial reuse. Since 1987, ISTC has presented Sustainability Awards to organizations in Illinois that have demonstrated a commitment to environmental excellence through outstanding and innovative sustainability practices. Any Illinois public or private organization is eligible to apply for the award.